Varsfontein stallions enjoyed a memorable weekend this past week, with Gimmethegreenlight sons National Park and Barahin running 1-3 in Saturday’s G2 Gauteng Guineas, and the Master Of My Fate son Silverstone Air romping home in the Kenya Guineas on Sunday. Silverstone Air, one of his promising sire’s very first winners, romped home in Sunday’s 1600m contest, winning the Britam Kenya Guineas as he liked. Now unbeaten in four outings, the colt looks a potential standout and is an excellent representative for his well performed young sire in Kenya. Silverstone Air, who was produced by the Fort Wood mare Lady Magic, was one of two winners for Master Of My Fate this weekend, with the son of Jet Master also enjoying local success on Friday. Master Of My Fate colt Masterful picked up his second win when scoring a courageous win for trainer Gavin Smith and jockey Teaque Gould at Fairview on Friday. The colt, a smart winner on debut, is bred and owned by Vanree Stud’s Brad Van Der Riet. Winner of both the G2 Premier Trophy and G2 Peninsula Handicap, Master Of My Fate has made a cracking start to his stud career. South Africa’s Leading First Crop Sire (By winners) in 2017-2018, the strapping son of Jet Master made a splash with his first crop headed by the very talented Twist Of Fate. To date, the latter (unplaced just once in 12 outings) has banked over R1.8 million with Twist Of Fate having already won all of the G3 BMW Politician Stakes, G3 Cape Classic and Listed Somerset 1200. 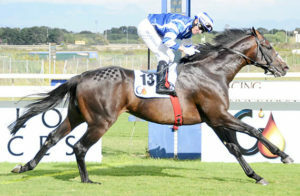 Master Of My Fate has four yearlings on offer at next month’s Cape Yearling Sale. efficitur. justo eget dolor. Nullam leo. porta.